I understand the reflexive impulse to oppose unions. I’ve got it. It’s the same premise as taxes: paying an involuntary fee just feels like some sort of violation. However, we have been able to convince ourselves that our tax dollars are at “work” despite most of it going to pay for senior citizen insurance and the military industrial complex, while no tangible benefit has been attached to unions within modern American culture. That’s a propaganda victory for dark money. Here’s a simple visualization of why unions of all stripes are important. Here's a quick sports analogy: It physically pains me to say this, but the New England Patriots are the smartest organization in all of sports. The NFL's Dark Underlord, Bill Belichick, understands football at a deeper level than perhaps any coach in history. Whatever tactics they try to take away from opposing teams, you can be certain that those tactics are those teams' most effective strategies. So the same maxim holds true for dark money. Late-stage capitalism has removed all doubt as to who the real rulers are in this country, and the story of dark money in the late 20th and throughout the 21st century is the story of fierce opposition to unions. America's oligarchs wouldn't spend billions in the shadows if they didn't think that destroying unions was that important of an issue for them. This also isn't just me saying it, this is a sitting congressman and the #2 Democrat in the DNC saying this. The sole fact that dark money is hyper-focused on removing unions from the American chessboard should move you to support unions. If it's bad for our oligarchs, then it's good for the people. Sports fans understand how important collective bargaining is for players, and that's the most visible benefit of your union dues. You're teaming up with your coworkers to make sure you can extract value from your hard work. This chart is directly related to the one at the top of this piece highlighting the decline in unions. We're increasing productivity in the American economy, but not getting paid in kind. 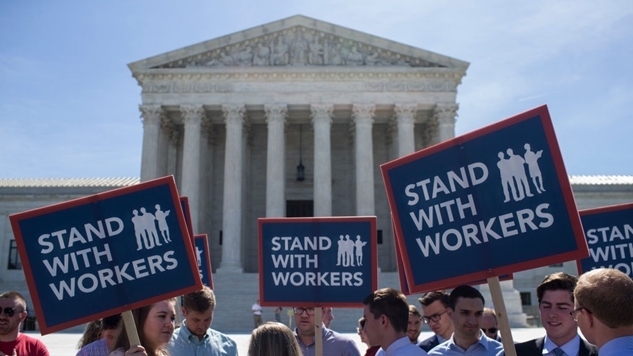 The Supreme Court ruled today that public sector union dues violate the First Amendment. Yesterday they ruled that even unlicensed crisis pregnancy centers (the ones set up by pro-life activists trying to talk women out of abortions) can obfuscate the truth about women's options on First Amendment grounds. The conservative majority on the Supreme Court isn't focused on the law. They're focused on enforcing the Republican agenda from one of the most powerful forces in our government. This is a sweeping decision. Justice Thomas' opinion even strikes down disclosure requirements for unlicensed crisis pregnancy centers, reaching much further than many predicted. California may not require unlicensed CPCs to disclose their lack of a license. If the Democrats capture Congress and the presidency at the same time, they should pass something like FDR's 1937 Judicial Procedures Reform Bill, which would have given him the power to appoint up to six additional Supreme Court Justices for every member of the court over the age of 70 years and six months. As the Supreme Court is presently constituted, that would give Democrats four more seats, with an 8-5 majority. If that sounds extreme to you, it's far less unreasonable than what Mitch McConnell and the Republicans did to steal a Supreme Court seat from under a Democratic president's nose. Article III of the constitution gives Congress the power to set the size of the Supreme Court. There's nothing in the constitution that specifically says we need nine justices. We have nine thanks to a bill from 1869. Our GDP is $19 trillion per year. There's 330 million people living here. Five geriatrics get to have the final word on policy that will impact all of us for decades to come? Five??? America is repeating all the mistakes of the Gilded Age, and even creating more extreme inequality in some cases. What followed our early 1900's capitulation to the uber-rich was a Great Depression and two world wars. It may seem difficult to connect a case which deals a potential death blow to unions in America to that kind of despair, but consider how remote a possibility child concentration camps seemed not too long ago. The Supreme Court has been a reactionary impediment to progress in America for most of our history, but this is a moment that requires a reprieve from that madness. Instead, they're marching us ever further along Trump's agenda. In 1857 the Supreme Court ruled slavery was legal. In 1929 they ruled in Buck v Bell that forcibly sterilizing women against their will was legal. In 1944 they ruled Japanese internment camps were legal. Today's #MuslimBan is in line with America's bigoted history. Something must change drastically, and soon. The Trumpening of America is well-underway, and today’s ruling on Janus is further proof that there is no separation between the governance of conservatism and Trumpism these days. It’s not a stretch to assert that American democracy depends on electing Democrats over the course of the next few elections. Even the famed conservative George Will agrees.